Wernher Restaurant: Dine Like Royals — Now That's a Honeymoon! Located inside five-star hotel Luton Hoo, Wernher Restaurant is the very definition of the words: British, fine, and dining. Named after Sir Julius Wernher who bought Luton Hoo in 1903, this 2AA Rosette restaurant offers British cuisine and a fine dining experience in a spectacular setting. During a weekend break in Luton Hoo, we dined here twice: breakfast and lunch. 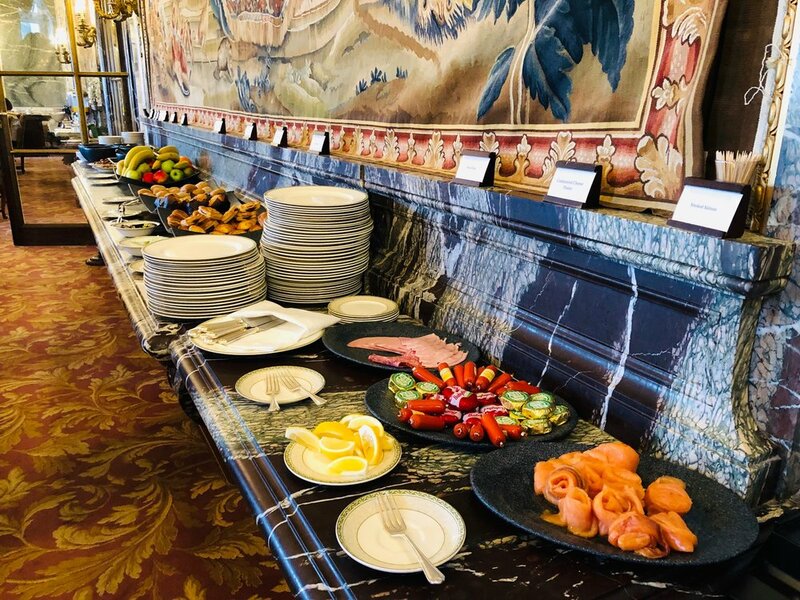 STAY AT LUTON HOO: WHY LUTON HOO SHOULD BE IN YOUR UK ITINERARY! I honestly don’t remember dining at a restaurant this magnificent nor would I normally use the word magnificent to describe a restaurant. Wernher Restaurant reminded us of Versailles’ extravagance with its elaborate style: tall windows overlooking a green meadow, glass chandeliers, massive tapestries (that stood as background for fruit juices and croissants during breakfast), and marble pillars on every corner. It was beautiful and excessive, elegant and extravagant. The restaurant’s lavish style calls for a dress code - guests are reminded that gentlemen wear a jacket or a tie after 12:30 PM. Don’t worry about breakfast especially if you’re staying at the hotel, but I’d still recommend you dress up for it. It was slightly embarrassing we came wearing gym clothes, but we were allowed to eat in peace nonetheless! We love Sunday Roast and this one certainly didn’t disappoint. Food and service is excellent. Lunching like a royal meant our plates were served hot with a domed cover, then removed simultaneously, something I only see in the movies, so that was really brilliant. Like can-you-do-that-again-so-I-can-post-it-on-Instagram kind of brilliant. With superb British cuisine in an elegant backdrop, Wernher Restaurant easily redefined fine dining. Whether you’re visiting for a special occasion, traditional afternoon tea, or if you fancy a romantic dinner with a British touch, we highly recommend Wernher Restaurant.